Mabprachan Garden Resort. This 2-storey house is a great size. Comprising 3 bedrooms and 3 bathrooms, it will be a really good home for a family. The house is set back from the street behind an electric gate, and has a small garden and undercover parking for 2 cars. The living area is huge, with a separate European kitchen, downstairs bathroom and storage area. Upstairs are the bedrooms and a family bathroom. The master is a very good size with its own living area, has a large balcony and an en-suite. The village is secured 24/7. The village is clean and tidy, and there’s a communal pool. 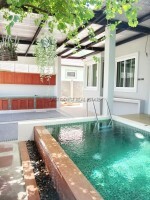 From here, access to Pattaya City takes about 20 minutes, and 10 minutes to the motorways. There are several good schools in the area. It’s a very peaceful location, but all that you want is not far away. Available for sale in a COMPANY name.